When our son Ian, age 9 was diagnosed with a brain tumour in January 2002 our whole lives fell apart. We were thrown into what seemed to be a black hole. So deep, we just couldn’t see a way out. We were terrified, our little boy, our family, shattered. There had been no warnings of what was about to happen. One Wednesday evening he became unwell and by the Sunday after several hospital visits, he was diagnosed with a very rare and aggressive brain tumour. Only the week previously he had been swimming and happily playing with his pals He underwent a seven hour operation on the Monday morning and was left fighting for his life in the intensive care unit of Beaumount Hospital. Ian spent the next four weeks here in an induced coma. This was followed by nine months of chemotherapy and radiotherapy on St. John’s Ward, Our Lady’s Hospital for Sick Children, Crumlin to try and kill off any remaining cancer cells. As if this wasn’t hard enough Ian also had to endure daily intensive physio-therapy as he had lost the power on his right side as a side effect of the tumour.Ian got through all this with the bravest attitude you could wish someone to have. He even found time to encourage other kids that were going through the same torturious experiences. He touched the hearts of his doctors and nurses and his physiotherapists so deeply. He even returned to school and was a source of such encouragement to his pals and teachers alike that his memory will live forever. Ian became ill again on June 16th 2003 and following another M.R.I. scan the tumour was found to have returned, this time it was inoperable. 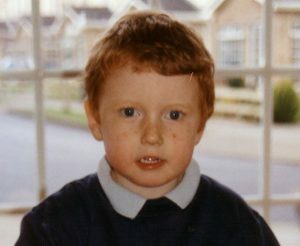 Five weeks later, our precious son Ian died, on July 24th 2003. He was 11.